The NZD is losing its power against the USD and also the oil prices is leaving impacts on this pair. NZDUSD is moving with bullish bias today within the ascendant channel. 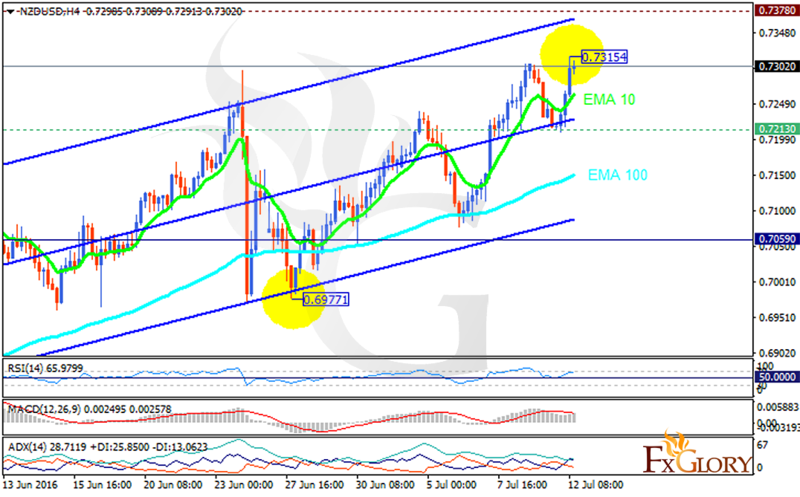 The support rests at 0.72130 with resistance at 0.73780 which both lines are above the monthly pivot point at 0.70590. The EMA of 10 is rising as well along with the EMA of 100. The RSI has reached the overbought area and there might be pullbacks at any time soon, the MACD indicator is in positive territory and the ADX is showing stronger buyers than sellers. 0.73 looks a strong resistance area therefore the price may not rise further, sellers can wait for price drop soon targeting 0.7150.